The Director of the Priority Research Centre for Geotechnical and Materials Modelling, Scott Sloan, has been awarded an inaugural Australian Research Council Laureate Fellowship. One of 15 nationwide, this fellowship has a total value of $2.7M over 5 years and will enable Scott to focus his attention on research. The topic of the project, Collapse Analysis for Geotechnical Infrastructure, continues the groundbreaking Newcastle work on developing new methods for predicting the stability of geostructures under static and cyclic loads. 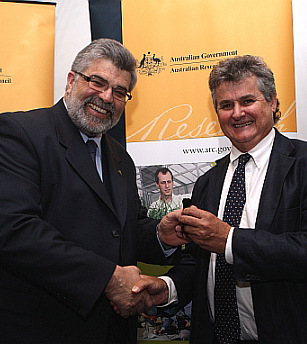 The Fellowships were announced by the Minister for Innovation, Industry, Science and Research, Senator Kim Carr, at an official launch on the 22 June 2009 in Canberra.